Sharks show an extreme diversity in their size. The largest shark species (indeed fish species) is the whale shark (Rhincodon typus), growing to staggering proportions. 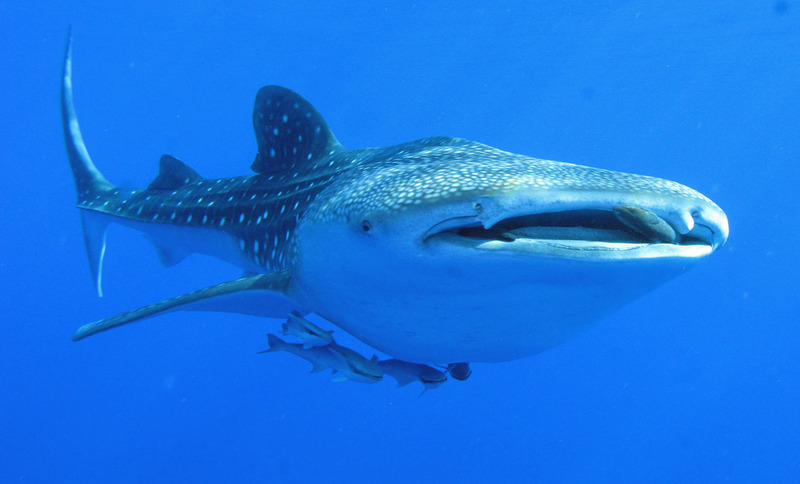 Several popular general science books cite the whale shark as attaining a maximum length of 18m, a length based on a communication to the journal Science back in 1925 by Hugh Smith. Smith wrote of a huge shark that became wedged in a bamboo stake-trap set on the east side of the Gulf of Siam (now the Gulf of Thailand) back in 1919. No official measurements were taken of the fish, but Siamese fishermen estimated it to be 10 wa (Siamese fathom) long. Unfortunately, there is a considerable elasticity involved in translating the Siamese fathom into metric units –one fathom equalling between 1.7 and two metres (5.5 to 6.5 ft.) depending who you ask. The average assumed in this instance was 1.8m (6ft), hence an 18m (59ft) shark. Several authors have since argued that 18 metres was probably an overestimation of this specimen. Indeed, until relatively recently, the largest faithfully measured whale shark was landed alive at Cuffe Parade on Bombay’s coastline in the Arabian Sea (northwest Indian Ocean) and measured 12 metres (almost 40ft). Since then, however, larger specimens have been observed. The largest accurately recorded specimen of which I’m aware was tagged and tracked with telemetry in June 1996 at Banco Gordo in the Sea of Cortez; this individual was 18 m (59 ft.) long. There are reports, however, of whale sharks attaining greater lengths and, in a short communication to the TRAFFIC Bulletin in 1997, Chen Che-Tsung and colleagues mention a whale shark landed in Taiwan's Lotung fish market in March 1987 that measured 20m (66 ft.) and weighed 34 tons (68,000lbs or 30,844kg). Despite the considerable length that this species obviously has the potential to reach, whale sharks commonly attain 12 to 14 metres (40 to 46 ft.) in length. Second in the ranking for largest shark species is held by the basking shark (Cetorhinus maximus). The largest accurately measured specimen was 11.5 m (38 ft.) and weighed in at 4,500kg (9,900 lbs). Prior to this, the largest individual came from Norway and measured 9.8m (32 ft.). Other authors have reported greater lengths; Parker and Scott (1965) reported a theoretical maximum of 12.26 m (40.22 ft.), which was later corrected to 12.76m (41.86 ft.). Furthermore, the late Mike Holden reported a maximum length of 13.72m (45ft) in his paper for Sea Fisheries Research (1974). Generally speaking, basking sharks typically reach between seven and nine metres (23 to 30 ft.). Indeed, in a paper presented to the first meeting of the European Elasmobranch Association at the Novotel, Birmingham in October 1996, Sam Pollard reported that of more than 3,000 basking sharks spotted off the UK, only eight percent (i.e. about 240 individuals) were over eight metres (26ft) in length. The megamouth shark (Megachasma pelagios) is often cited as the third largest shark species, but this crown actually goes to the great white (Carcharodon carcharias). Shark literature is rife with overestimations of white shark size, some suggesting that these fish may reach more than 11 metres in length. A paper by John Randall in the journal Science back in July 1973 challenged these reports, suggesting a maximum size of eight metres (26ft) based on bite marks on whale carcasses from south Australia. Today, most white sharks encountered fall into the 3.7 to 4.9 m (12 to 16 ft.) range, although Aidan Martin, noted they may reach a theoretical maximum of 7.1 m (23 ft.) and weigh as much as 2,300kg (5060 lbs). According to the Canadian Shark Research Centre, the largest accurately measured great white was a female caught in August 1989 at Prince Edward Island off the Canadian coast (North Atlantic) and measured 6.1 m (20 ft.). The smallest species of shark is still a matter of some contention among biologists. Leonard Compagno attempted to answer this question in his 1988 review of the systematics of the Carcharhiniformes (the “whaler sharks”) but the problem seems to be that we don’t currently have sufficient data on most of the smallest shark species to establish a clear winner. There have been several contenders for the title and most popular literature has considered the spined pygmy shark (Squaliolus laticaudus) the smallest. In 1974, a paper in the Indian Journal of Fisheries, reported the capture of some smooth dogfish (Eridacnis radclffei) from the Gulf of Mannar. Of the 15 adult females found, a 15cm (6 in) individual had large ovarian eggs. Unfortunately, the presence of ovaries is not necessarily a sign of maturity and, more often than not, detailed histological analysis of the eggs is required. In his review of this topic, Aidan Martin proposed that the aptly named dwarf lanternshark (Etmopterus perryi) should be tentatively considered the smallest extant (living) shark species, based on developing embryos found in one 19cm (7.5 in) individual. Sharks inhabiting UK waters tend not to reside at either size extremity; the exception being the basking Shark. With the basking shark as the largest British shark, the Greenland shark (Somniosus microcephalus) probably follows in second place. These sluggish deep-water sharks can reach lengths of 7.3m (24 ft.) and weigh a hefty 760kg (1,675 lbs). Threshers (Alopias vulpinus) are also a well-known UK shark species, and these sharks can reach 7.6m in length and weigh 348kg (767 lbs). However, the thresher (also referred to as the “fox shark”) has an epicaudal lobe (i.e. the upper part of its tail) that is almost as long as its body, making total length measurements somewhat exaggerative. UK waters also play host to several reasonably large summer visitors. The blue shark (Prionace glauca) is known to reach lengths of 4m (13 ft.) and weigh 200kg (441 lbs), and the shortfin mako (Isurus oxyrinchus) also reaches 4m, but can weigh over 500kg (1,102 lbs). Another summer visitor, the porbeagle shark (Lamna nasus) grows to 3.5m (11.5 ft.) and can weigh almost 230kg (507 lbs). Our year-round residents tend to be smaller than the summer visitors, with the flattened angel shark (Squatina squatina) attaining a maximum of 2.5m (8 ft.) and weighing 80kg (176 lbs); the tope shark (Galeorhinus galeus) reaches 2m (6 ft.) and 45kg (99 lbs) whilst the bottom-dwelling small-spotted catshark (Scyliorhinus canicula) and greater spotted catshark (Scyliorhinus stellaris) reach one and 1.7 metres (3.3 and 5.5 ft.), respectively. UK ray species tend, overall, to be smaller than their selachian kin. The common skate (Dipturus batis) is probably the UK’s largest batoid, reaching almost 3m (10 ft.) and weighing in at a maximum of 97kg (214 lbs). The blonde (Raja brachyura) and thornback rays (Raja clavata) both attain maximum lengths of about 1.2m (4 ft.) and weigh a maximum of 14.3kg (31.5 lbs) and 18kg (40 lbs), respectively. Undulate rays (Raja undulata) reach about one metre (just over 3ft) in length, whilst the common stingray (Dasyatis pastinaca) and smalleye ray (Raja microocellata) reach about 90cm (3ft).